Z-Axis are based in Atlanta, GA, an interesting four-piece prog-rock outfit that integrate quite a few different sounds and styles, both vintage and modern. They've been going for about a decade now, though this is only the band's second official CD. Keyboardist Allen Welty-Green and bassist/vocalist Jeff Tyson are the principal songwriters, and the core unit is filled out with guitarist Mark Baker and drummer Phillip Hart. Z-Axis can "rock out" some, though they're held back a bit by the thinness (or "lightness") of the overall sound, and in particular, the percussion. I could tell Hart has an acoustic kit, but it was only when I saw his photo on their website that I understood why it sounds thin. He's got one of those silly kits with the wimpy rototoms in place of the bulkier, heartier toms. When it comes to real *rock*, I'm a stickler for drums-to-be-drums, a la Cozy Powell, so this is a small downer for me. Nevertheless, Z-Axis have a host of really good songs here, and some awesome spacey passages to delight the cosmic traveller inside all of us. tapestries of spacey sounds and washes as in the final outtro. "Too Clever By Half" continues in form as a long, 9-minute opus, full of ideas spanning the complex to the textural, and also is the rare song with actual singing. Parts of this one come across like an old 70s Eloy tune but with modern post-rock touches, such as e-bow guitar drone. The synth sounds here come straight from the Tim Blake/Ozrics axis. The strong mid-section of the album goes on through the quiet, dreamy tune "The Grey Neighbours" (the nice simple melody provided by a melodica, the funny little keyboard-thingy you blow into), which then segues nicely into "Big Bend." Again, e-bow guitar helps to provide the textural thickness to produce the right backdrop for the repeated guitar motif and the echoed, semi-spoken lyrics. "Dry Land" and the finale "Columbia Dam" are both very atmospheric instrumental songs that have a Japanese flavor to them, almost a nod to Kitaro here and there. As a layman, I can't say for sure, but perhaps these are built on a pentatonic scale. Something makes them sound Japanese anyway. I like them both. Plus here, Hart's tribal drumbeat (same toms?) works perfectly here as they're totally out of "rock mode." Baker's guitar soloing here and elsewhere is also quite tasty, reminding me often of Eloy's Frank Bornemann. "Put out the Cat" is the heaviest that Z-Axis gets here, a fine instrumental track built on an especially chunky bassline, but it could still use some of the balls that Porcupine Tree suddenly has developed in recent years. 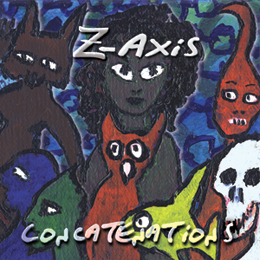 All in all, though, I was quite impressed with 'Concatenations' and give Z-Axis high marks for composition, integration of styles, and technical ability. With perhaps a touch of "metal attitude" and a few more memorable lyrical passages, they could really become great.